You would think that buying an A/V receiver would be a relatively easy task: Simply find a model that has the number of channels you need and the features you want at a price you’re comfortable with and call it a day. Unfortunately, that usually isn’t the case. From intentionally misleading specs to the explosion in available features, it’s harder than ever to pick a top receiver from the ever-expanding options. For one thing, you want to make sure you pick a receiver that is the most compatible with products you already own. Do you want support for Google Home? What about wireless multiroom? Then, of course, there’s the actual audio quality, which can’t be gauged from a list of specs. Fortunately, even cheap-seat receivers these days support the most sought-after features, from DTS:X and Dolby Atmos to hi-res streaming, 4K and HDR support, and much more. All you really need is a good starting point, and that’s why we’re here. We’ve had the chance to experience for ourselves many of the top receivers available. Combining our hands-on experience with our collected years in the industry, we’ve compiled a list of some of the absolute best models you can buy. Why you should buy this: It offers fantastic sound and every feature you could want. The MRX 1120 offers clean power, plenty of headroom, every feature you need, and has some of the best room -orrection software available. Who it’s for: Anyone who places a premium on top-notch sound. Anthem is a well-known name among those who demand top-tier sound quality in their A/V receivers, and the 11.2-channel MRX 1120 is the top dog of the company’s latest offerings. The MRX 1120 packs a massive Toroidal power supply, offering a claimed 140 watts of clean power per channel at 8 ohms. It features support for both Dolby Atmos and DTS:X object-based surround sound, in either 7.1.4 or 5.1.4 configurations, depending on whether you want to leave channels free for a second zone for another room in your home. And that’s just for start. The MRX 1120 also offers wireless multiroom connectivity via DTS Play-Fi. This is bolstered by built-in support for a number of popular music streaming services, including Spotify, Tidal, Amazon Prime Music, Pandora, SiriusXM and internet radio. For those who value fidelity over convenience, hi-res audio support is included as well, which makes good use of the receiver’s 32-bit/768 kHz differential-output digital-to-analog converters (DACs). When it comes to video, the MRX 1120 naturally offers support for 4K and high dynamic range (HDR) content in both HDR10 and Dolby Vision formats, with support for 4:4:4 chroma and BT.2020 colorspace. A built-in upscaler is also included, bringing standard and high-definition signals up to 4K quality, independent of your 4K TV’s internal upscaler. A total of eight HDMI inputs are included, all of which support HDMI 2.0a (for the aforementioned 4K/HDR device connections) and HDCP 2.2. There are also two HDMI and three digital audio outputs. Finally, the Anthem MRX 1120 makes setup a snap via Anthem Room Correction software, which is one of the best room calibration systems out there. The company even includes a high-quality mic and stand for measuring your room’s acoustic properties right in the box. Why you should buy this: Seven channels of serious power and tons of features at a great price. The Onkyo TX-RZ820 offers all the features you’ll need, from 4K HDR to Dolby Atmos, and much more. Who it’s for: Anyone who wants a powerful, feature-packed receiver for under $1,000. 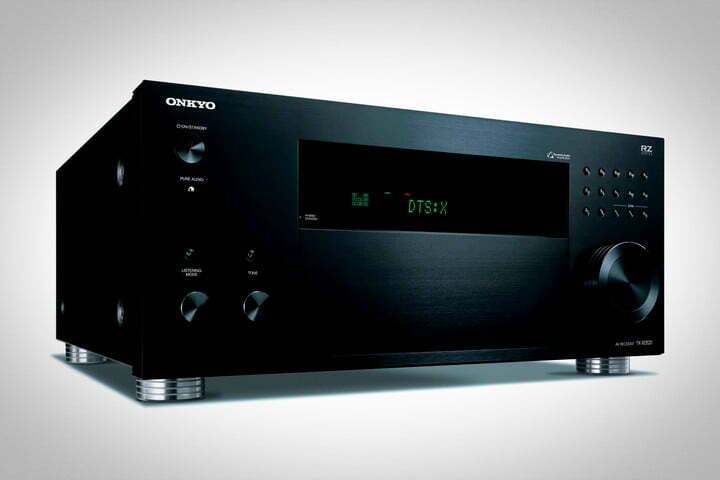 If the price tag on the Anthem model is too rich for your blood, the Onkyo TX-RZ820 lowers the price significantly without losing much in the way of features. This 7.2-channel model supports both Dolby Atmos and DTS:X, as well as 4K Ultra HD passthrough with HDR10 and Dolby Vision HDR support. In addition, this model is THX Select-certified, helping assure it will do your favorite movies justice. The TX-RX820 offers 130 watts per channel at 8 ohms, and uses Onkyo’s Dynamic Audio Amplification with high-output transformers and customized capacitors to provide powerful, effortless sound. The receiver offers a total of seven HDMI inputs, and two HDMI outputs are included, with one available to be used for a second zone. Wireless connectivity options are plentiful, with Bluetooth, Wi-Fi, AirPlay, and built-in Chromecast all supported. Streaming services like Spotify, Tidal, Pandora, and Deezer are included, and so is hi-res audio streaming at 24bit/192kHz and DSD 5.6 MHz. While it isn’t quite as top-notch as Anthem’s room correction, this model features Onkyo’s AccuEQ room correction, including AccuReflex, and does include a small microphone for measurement. Power users may want to do a manual calibration, however. Why you should buy this: You want a quality receiver with smart features that doesn’t dominate the room. 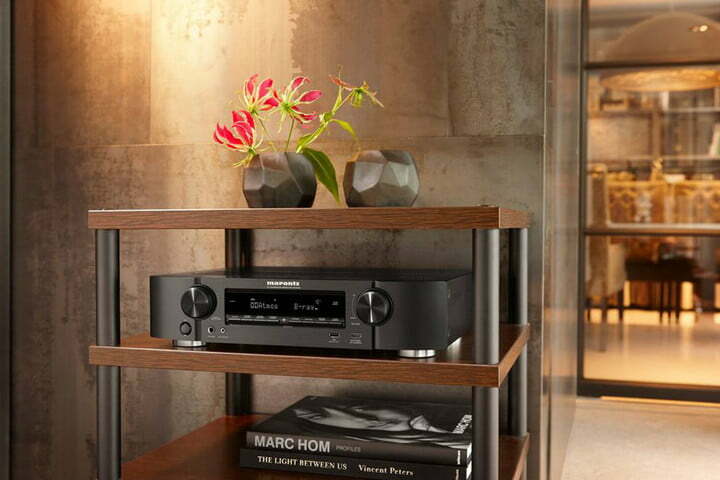 The Marantz NR1608 offers all the features found in other receivers, but in a slimmer, more attractive package. Who it’s for: Anyone who wants a feature-packed receiver with a slim footprint. A/V receivers are often the largest piece of gear sitting under your TV, and while this isn’t an issue for some, that doesn’t mean everyone is happy with a bulky box. 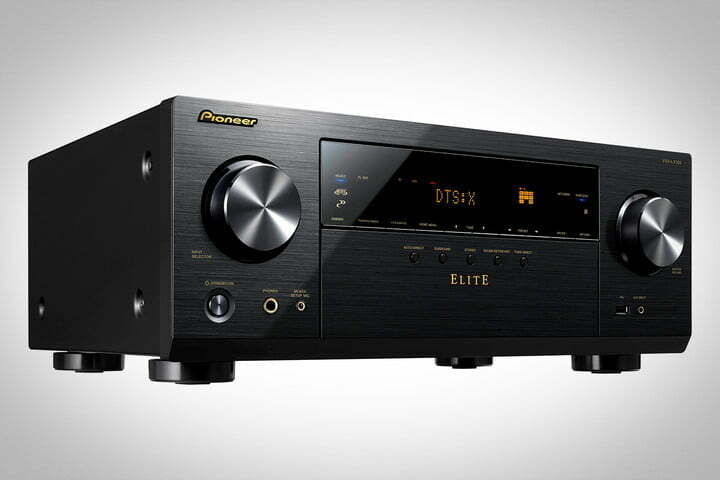 The Marantz NR1608 offers top-notch sound and many of the same features of other receivers on this list, but has a slimmer build and smaller footprint, making it a better option for those who don’t have much space or simply find a smaller piece of gear more aesthetically pleasing. You do sacrifice a bit on power. The 7.2-channel model is rated at 50 watts per channel at 8 ohms — not exactly a powerhouse compared to some of the other models on this list, but still more than enough for the home theater needs of many. This model features eight HDMI inputs, all of which support HDMI 2.0a with both HDR10 and Dolby Vision HDR support, HDCP 2.2, and 4:4:4 color and BT.2020 – making it about as future-proof as you could hope for. Both Dolby Atmos and DTS:X are supported out of the box, serving all your object-based audio needs. Wi-Fi and Bluetooth are included for wireless connectivity, and so is hi-res audio support at up to DSD 2.8 MHz and 5.6 MHz in addition to other standard hi-res formats at 24bit/192kHz. This model also features multiroom integration in the form of AirPlay and HEOS, and is even Alexa-enabled, meaning you can control some features with your voice. It also comes with software for setup and room correction by way of Audyssey MultEQ, the system favored by Marantz and Denon. If you’re looking for a slim-but-savvy brain to run your home theater, the NR1608 is a fantastic option. Why you should buy this: Price matters to you, but you still want the best sound you can get. With lots of power and Dolby Atmos and DTS:X integration, the Pioneer VSX-LX102 is the best A/V receiver for under five Benjamins. Who it’s for: Home theater enthusiasts who want to get the most out of each dollar. Where previous picks in the sub-$500 category require listeners to forgo cutting-edge features like Dolby Atmos and DTS:X object-based surround sound, Pioneer’s impressive VSX-LX102 has found a way to integrate that technology and more, providing some of the most compelling bang-for-the-buck in home audio. A 7.2-channel receiver (5.2.2 for Atmos and DTS:X setups) with 80 watts per channel at 8 ohms, this beauty is more than capable of filling all but the biggest rooms with clear, dynamic audio. The receiver also supports 4K Ultra HD video with HDR10 and Dolby Vision HDR, as well as BT.2020 and HDCP 2.2, which should provide years of future-proofing for your home theater setup. The VSX-LX102 offers built in Wi-Fi and Ethernet ports, including hi-res streaming from your computer or NAS device, and modern accouterments like Chromecast and DTS Play-Fi built-in for multiroom integration. Those after great sound in their space will also appreciate the inclusion of the company’s Multi-Channel Acoustic Calibration System (MCACC) room-tuning software. Why you should buy this: You value ease of use and quick setup over mile-long feature lists. 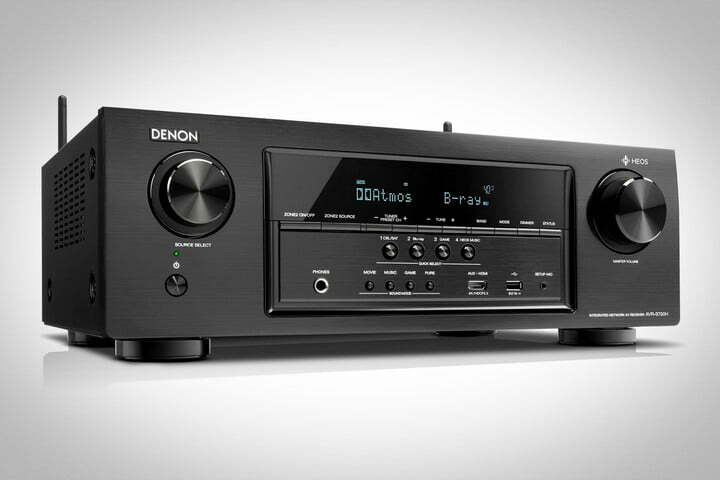 The Denon AVR-S730H combines an affordable price tag, large feature set, and one of the most easy-to-use interfaces available today. Who it’s for: Anyone who wants a receiver that you don’t need to take a class to set up. This final model is aimed at those who want something that is not only very affordable but also extremely easy to set up and use. The 7.2-channel Denon AVR-S730H fulfills those requirements and more, while still bringing plenty of power and features along for the ride. This model offers a claimed 75 watts of power per channel at 8 ohms, as well as full 4K Ultra HD with HDR10 and Dolby Vision pass-through. It even includes support for Dolby Atmos and DTS:X object-based surround sound, something that was unheard of at this price a few years back. The AVR-S730H features six HDMI inputs and one output, all of which support HDMI 2.0a and HDCP 2.2, as well as 4:4:4 Pure Color sub-sampling and BT.2020 color space. 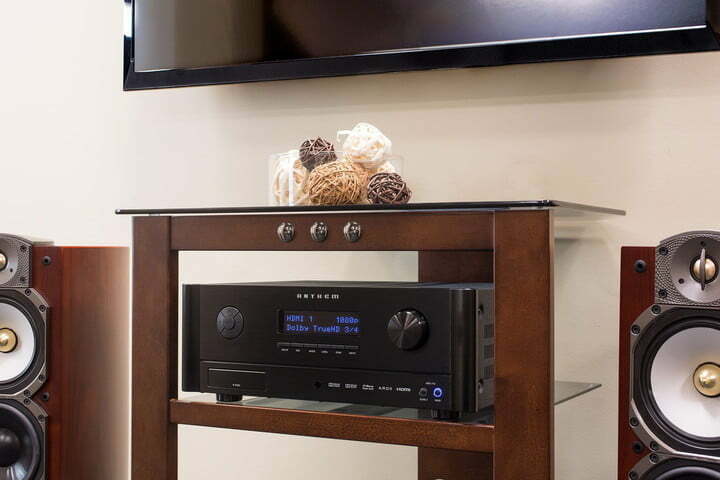 Connectivity options are plentiful, including Bluetooth, Wi-Fi, AirPlay, and the ability to stream from DLNA servers in your home. A fair number of streaming services are natively supported, including Pandora, Spotify, and Amazon, as well as SiriusXM. Hi-res audio streaming is also supported, including DSD at 2.8 MHz and 5.6 MHz, in addition to standard PCM formats at 24bit/192kHz. Where the AVR-S730H really shines is in its setup — which uses Audyssey MultEQ and graphical icons on the screen to offer one of the most intuitive interfaces on the market today — with easy control via the iOS- and Android-enabled AVR Remote app. Like the Marantz NR1608, it’s also Alexa-enabled, allowing you to control some basic functions with your voice. 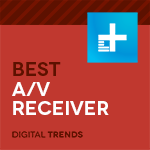 Collectively, the A/V team at Digital Trends has been testing A/V receivers for just over 30 years. Testing takes place both in a dedicated home theater lab at our headquarters in Portland, Oregon, as well as our individual home theater spaces. Source equipment includes a Roku Streaming Stick+, Oppo UDP-203 4K Ultra HD Blu-ray player, Panasonic UBP900P 4K Ultra HD Blu-ray player, Pioneer BDP-88FD Blu-ray player, U-turn Orbit turntable, various smartphones, Spotify, Tidal, and Pandora. We also keep a Peachtree Nova 220 SE integrated amplifier nearby for reference. Connected speakers include a rotating cast of speakers, including many Dolby Atmos-enabled models. Past test speakers include Pioneer Elite floor standing, bookshelf and center channel speakers, Aperion Audio Verus Grand, Bowers & Wilkins CM8 S2, Elac UB5, Paradigm Monitor 8 subwoofer, and GoldenEar technology SuperSub XXL, though our assortment of test speakers constantly rotates with new models. Test material includes a wide array 4K Ultra HD Blu-ray discs with Dolby Atmos and DTS:X surround encoding, Super Audio CDs, DVD-Audio discs, Redbook CDs, hi-res audio files, and Spotify’s high-quality (320 kbps) music streams. While we routinely run any given receiver’s auto setup routine to gauge its accuracy and user experience, we ultimately perform a manual calibration using an analog SPL meter, carefully choosing crossover points for connected speakers based on in-room measured low-frequency response. Surround speaker arrangements will vary between 7.2 and 5.2.4. Receivers are tested for ease-of-use, with special attention paid to how easy it is to stream music to the receiver as well as direct-stream internet radio stations. We also pay attention to how clear on-screen guides and setup instruction will be for novice users. Sound quality tests include analysis of dynamic expression, overall power, timbre, and tonality, speaker-to-speaker transitions of sound effects, and general soundstage quality. For some time, the rate at which features were being added made buying any A/V receiver a risky proposition if you didn’t want to be stuck with something that quickly went out of date. With 4K, HDR, HDMI, and HDCP seemingly having everything worked out for the 4K era, it’s much safer to buy a receiver now without worrying that you’ll quickly see the future pass you by. Dolby Atmos and DTS:X seem entrenched as the two major leaders in object-based surround sound — no surprise, given the lead both Dolby and DTS have generally had in surround sound technologies — so you should be safe there too. The one area that could possibly change is high-resolution audio, as even many of the above models don’t support everything possible yet, though that is quickly changing as well. If this is very important to you in a receiver, you may want to consider a separate DAC. For everyone else, it’s a fairly safe bet that any of the above models should keep you happy for a long while. 4K: Higher resolution than HD (3840 X 2160). Quickly becoming the standard for new TVs. Dolby Atmos: One of the two most popular object-based surround formats, Atmos adds height information so sound can seem to come from above and all around you. DSD: Direct-Stream Digital. A hi-res audio file format alternative to .WAV, .AIFF, and others that aims to reduce distortion. DTS:X: The other most popular object-based audio format, DTS:X can be more flexible than Dolby Atmos when it comes to where speakers are placed and how many of them there are. HDCP 2.2: A form of copy protection, this version is required in order to play 4K content. HDMI 2.0a: While it isn’t the newest version of HDMI, this version is the first that allows HDR signals and 4K content at up to 60 frames per second. HDR: High Dynamic Range, offers better contrast and more color volume than standard dynamic range. Considered by some a bigger visual improvement than 4K resolution. Will U.S. government force Facebook to decrypt Messenger?